You won’t find a one-size-fits-all approach at Oregon State. Our programs are designed to meet your needs on your terms: - Choose your Concentration: At Oregon State, you can customize your experience by choosing among seven tracks, including Business Analytics, Commercialization, Executive Leadership, Global Operations, Marketing, Research Thesis or Wealth Management; and two additional degrees, Accountancy MBA and Pharmacy MBA. - Attend Class Full-time or Part-time: if you are highly motivated and have a business background, you can earn your MBA in as little as nine months. If you are unable to attend school full-time, we will help create a custom plan of study that allows you to earn the same degree on a schedule that works for you. To accommodate working professionals, our MBA courses are available in the evenings. Most tracks can be completed on a part-time basis in 2-3 years. Pick Your Format: While most tracks are taught on-campus in Corvallis, the Executive Leadership track is offered in both Portland and Bend. This program is taught using an online/hybrid model in which about 70% of the course material is available online while the remaining content is presented during face-to-face class sessions, about once a month (per course). Learn by Doing – You won’t spend all of your time in the classroom at OSU. While our academic standards and quality of instruction are second to none, we believe in supplementing rigorous classroom instruction with practical, hands-on opportunities to learn by doing. This model gives you both the knowledge the experience you need to lead in an increasingly complex and interconnected business environment. As an MBA student at OSU, you will work collaboratively in multi-cultural, interdisciplinary teams and will have opportunities to: - Complete an integrated business project in your chosen field of study - Develop a comprehensive business plan for bringing a new OSU technology to market - Work with early stage startups and emerging technology organizations at the OSU Accelerator - Improve your leadership skills by serving on the MBA Association board - Build a global professional network by interacting with classmates, faculty, alumni, investors and other OSU Stakeholders A Beautiful Place to Learn – If you are looking to study in friendly, safe community with countless recreation options, then Oregon State is the place for you. Corvallis is located in the heart of the Willamette Valley, close to major employment centers in both Portland and Seattle, and has been recognized as one of the best college towns and one of the top ten places to live in various surveys. Numerous hiking, biking and camping opportunities are available in and around the surrounding area. Corvallis has a vibrant live music and arts scene, and great skiing is less than two hours away. When class is in session, you will be at Austin Hall, a brand new facility for business students at Oregon State that opened this fall. Austin features 10 state-of-the-art classrooms, a computer lab, a 250-seat auditorium and lots of open space for students to work on group projects. A Robust Support System - Earning an MBA takes time and effort, but you won't be going at it alone. Our faculty understand these challenges and are ready to help you succeed in the classroom and beyond. Many faculty members at the College of Business have industry experience in addition to their academic credentials. These experiences translate into meaningful learning opportunities as well as possible introductions to leading and emerging organizations. Choose your Concentration: At Oregon State, you can customize your experience by choosing among seven tracks, including Business Analytics, Commercialization, Executive Leadership, Global Operations, Marketing, Research Thesis or Wealth Management; and two additional degrees, Accountancy MBA and Pharmacy MBA. Attend Class Full-time or Part-time: if you are highly motivated and have a business background, you can earn your MBA in as little as nine months. If you are unable to attend school full-time, we will help create a custom plan of study that allows you to earn the same degree on a schedule that works for you. To accommodate working professionals, our MBA courses are available in the evenings. Most tracks can be completed on a part-time basis in 2-3 years. Pick Your Format: While most tracks are taught on-campus in Corvallis, the Executive Leadership track is offered in both Portland and Bend. This program is taught using an online/hybrid model in which about 70% of the course material is available online while the remaining content is presented during face-to-face class sessions, about once a month (per course). A Beautiful Place to Learn – If you are looking to study in friendly, safe community with countless recreation options, then Oregon State is the place for you. Corvallis is located in the heart of the Willamette Valley, close to major employment centers in both Portland and Seattle, and has been recognized as one of the best college towns and one of the top ten places to live in various surveys. Numerous hiking, biking and camping opportunities are available in and around the surrounding area. Corvallis has a vibrant live music and arts scene, and great skiing is less than two hours away. When class is in session, you will be at Austin Hall, a brand new facility for business students at Oregon State that opened this fall. Austin features 10 state-of-the-art classrooms, a computer lab, a 250-seat auditorium and lots of open space for students to work on group projects. A Robust Support System - Earning an MBA takes time and effort, but you won't be going at it alone. Our faculty understand these challenges and are ready to help you succeed in the classroom and beyond. Many faculty members at the College of Business have industry experience in addition to their academic credentials. These experiences translate into meaningful learning opportunities as well as possible introductions to leading and emerging organizations. 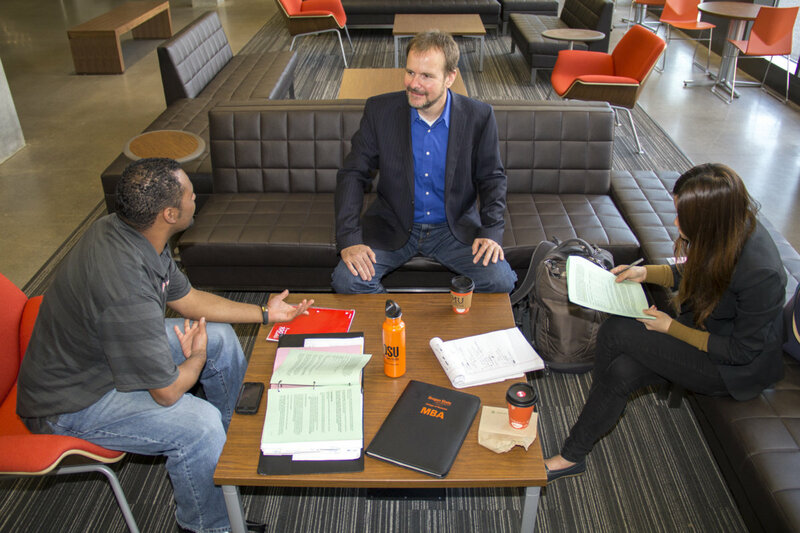 Want more info about Oregon State University College of Business Full Time MBA? Get free advice from education experts and Noodle community members.